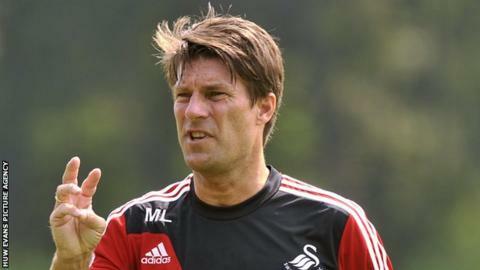 Swansea City manager Michael Laudrup says his side face a stern test at Norwich City in the Premier League on Sunday. After a slow start to the season the Canaries have won three of their last five matches and lie two points behind the Swans. Laudrup's side have not beaten Norwich since promotion to the top flight in 2011 and the Dane expects a hard game. "This is a tougher game than it would have been a month ago," he said. "If they beat us they go above us by a point. That's how it is, maybe a month ago or in a month's time it would be different, but we are not playing last month, we are playing Sunday." Laudrup says he watched Chris Hughton's side against West Ham when Norwich were struggling. Swansea City's Premier League bogey team? "In the first half they were outplayed and could have been three or four nil down," said Laudrup. "Then in the second half they got a penalty and a great free-kick from Robert Snodgrass and went on to score a third goal. "Since then in the last three games they have won two. "Suddenly from being in a very difficult position they are right up there." Swansea City progressed to the last 32 of the Europa League despite losing in Switzerland on Thursday. The Swans have only won two of their last seven league matches and Laudrup is hoping the two month gap until their European campaign resumes will help his side find some form. "It (the Norwich match) will be the seventh game in 20 days with some players playing in four, five or six of those," said Laudrup. "But we have to get everything we can out of this game and then on Monday we can enjoy the Europa League draw and then park that competition until the end of February. "It is always easier to focus on one competition, especially if you are not experienced in playing in Europe. "This is the first time in the Europa League for us and we are only in mid-December but we've already had 10 games in this competition. "That's a lot of games. "Last year we thought we'd played a lot of games, but we've played more this year at a similar stage."